A number of LSU AgCenter Entomology Faculty have been working on an exciting new project. In a nutshell, we have created a series of webpages that are an introductory online entomology course. Because these webpages are electronic, we can adapt them for a variety of educational purposes. I hope you take a moment to visit the website by clicking here. Let me know what you think about what we have developed and how we can adapt it for your needs. You can read more about our project in this article in The Advocate. Identifying insects as native or invasive species just got easier with help from the LSU AgCenter entomology department. LSU AgCenter entomology specialist Natalie Hummel and extension associate Michael Ferro, are working with colleagues at the University of Florida, the University of Georgia, North Carolina State University and the University of Tennessee to build a website that will help not only professionals, but the average citizen identify insects. The First Detector Entomology Training Project consists of a series of Web pages that allow people with little or no experience to learn about the world of insects and arthropods, insect collecting and insect photography. The project will develop a train-the-trainer general entomology training course for first detector educators such as county extension agents and Master Gardeners, along with first detectors, which include border inspectors and homeowners. “I tried to develop the website in such a way that you could come to the site with little or no knowledge of insects and walk away with something,” Ferro said. The advantage of this system over print publications is the ability to quickly update information and not have to worry about the information going out of date. “Also we didn’t want people having to attend a workshop or sign up for a class since things are now more global and mobile,” Hummel said. The information on the Web pages were designed for Master Gardeners and extension agents but can be used by anyone interested in learning more about insects and arthropods, including teachers and students. The pages provide a general overview of entomology and are designed to help users recognize common arthropods, whether pests or non-pests, confirm the identification of pest problems and recognize and report suspect, unusual, exotic or invasive species, the developers said. Some major insect orders, such as true flies, true bugs and beetles, get their own wiki pages that highlight specific examples of commonly encountered pests or non-pests. The training project consists of several wiki pages that provide a good overview of arthropods in general, insects and entomology, Hummel said. Topics include how to photograph insects, how to collect and preserve insects, basic insect biology and a brief introduction to the major orders of insects, she said. “There are some invasive pests, like the brown marmorated stink bug, that we don’t have now, but it is rapidly making its way south from the northeastern United States,” Hummel said. Having the Web site should make people aware of these type invasive insects before they become a problem. “In addition to the Web pages, we are also making PowerPoint presentations so that extension agents, Master Gardeners or others can download these PowerPoints and use them as presentations about the information on the Web pages,” Ferro said. The third piece of the project involves the development of e-learning modules that are entirely online where tutorials will be available. After viewing them, individuals can test their knowledge by taking a short quiz, he said. Hummel said the future of the project is “limitless.” One of the next steps could be to develop it into a smartphone app that would allow the information to become more mobile. The 3rd Annual LSU AgCenter Advanced Entomology training was held at the rice research station in Crowley on Sept 13, 2011. The training focused on secondary pest problems and the Mexican rice borer. If you could not attend the training, or you just want a refresher of what was discussed, the powerpoint files have been posted at http://www.lsuagcenter.com. Click here to open the website. As you can tell from a lack of activity on this blog, the field season is winding down. We are summarizing our Tenchu rice stink bug demo data now and will be posting online soon. I hope you are enjoying this nice fall weather. ﻿88% of the respondents who completed the survey reported that they treated for rice stink bugs in the 2009 crop season. Interestingly, this is an increase of 10% from the 2008 production season. The next series of questions focused on rice stink bug management practices. We are interested in these practices because we are currently re-evaluating LSU AgCenter rice stink bug management recommendations. We are also testing some products that appear to have improved residual efficacy against rice stink bugs. 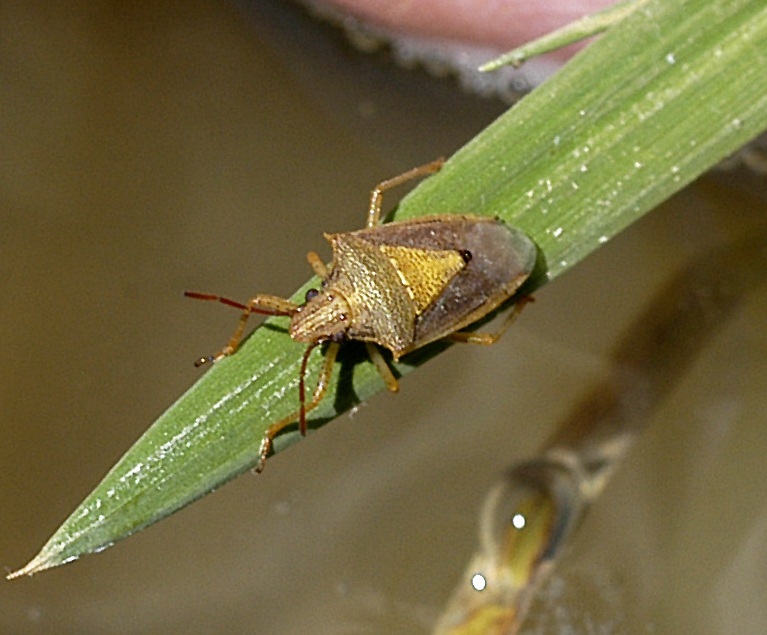 When asked – “how many times did you treat (a single field) with an insecticide for rice stink bugs in 2009?” – the majority of respondents from Louisiana reported that they treated with a single application of insecticide (47%), while in Texas the majority of respondents reported treating twice (42%). 33% of respondents from Louisiana reported that they did not apply any insecticides for rice stink bug management. These figures are in agreement with many years of research and field work that have found that rice stink bugs are historically a more significant pest of rice in Texas than in Louisiana. When the most common insecticide use was reported, we found that the majority of respondents use a pyrethroid (Karate or Mustang) for control, followed by Malathion and Methyl 4ec. While in Texas, producers have readily adopted a new chemistry – Tenchu 20SG. 40% of respondents from Texas reported that they treated some fields with Tenchu 20SG. This is a neonicotinoid insecticide that provides efficacy equivalent to the pyrethroids, but has a longer window of residual activity. This longer residual activity results in a reduction in the total number of insecticide applications to a given field. This chemistry is currently not registered for use in Louisiana, but the company is pursuing a federal registration. We also inquired about scouting practices, and fortunately 91% of Louisiana respondents reported that they scouted for rice stink bugs before making an insecticide application. We recommend that scouting should precede all insecticide applications. In Texas, 100% of respondents reported that they scouted before applying an insecticide for rice stink bug management. If you have questions about rice stink bug scouting methods please contact your local county agent or me. Respondents were asked to describe their perception of the severity of their rice stink bug infestation in 2009. In Louisiana, most of the respondents (60%) reported a low infestation, while 36% reported a moderate infestation. While, the reverse was reported in Texas, where 59% reported a moderate infestation and 31% reported a low infestation. We will be passing out these surveys again at the winter production meetings. It will be interesting to see how insect infestations and treatments varied in the 2010 production season. Thank you again to all who took the time to complete the survey. If you reach way back in your memory, some of you may remember completing the 2009 Louisiana rice insects survey at one of the winter production meetings back in January or February of this year. The surveys were distributed in Louisiana, Texas, Missouri, Mississippi and Arkansas this year. Anna and I have recently completed a summary of the responses and I’ll use this series of posts to provide an overview of a few observations. Keep in mind that the trends reported in this posting relate to the 2009 production season, not the 2010 production season. We will distribute a survey about the 2010 production season at the winter meetings in January. Participants from the circled Louisiana parishes completed our survey. 184 survey sheets were processed from the following states: Louisiana (146), Texas (47), Missouri (5), Mississippi (2), and Arkansas (1). In Louisiana, respondents from the following parishes completed surveys: Acadia, Avoyelles, Beauregard, Calcasieu, Caldwell, Cameron, Catahoula, Concordia, East Carroll, Evangeline, Franklin, Jefferson Davis, Lafayette, Madison, Morehouse, Ouachita, Point Coupee, Rapides, Richland, St. Landry, and Vermilion (see map above). We would like to thank all rice industry members who participated in this survey and helped to distribute the survey sheets. This survey was supported in part by the Louisiana Rice Research Board and the Southern Region Integrated Pest Management Program. My comments will mostly be confined to the Louisiana responses at this time. The demographics of the participants in Louisiana was broken down as follows: rice farmers (79%), consultants (12%), dealers (7%), and others (10%, e.g. county agents, researchers, manufacturer representatives, marketing managers and land owners). The length of time that repondents have been involved with rice production varied from less than five to more than forty years, with the greatest percentage (18%) with 26 to 30 years of experience. Approximately 76% of the survey respondents farmed or consulted on less than 2500 acres of rice in the 2009 production season. The first series of questions related to insect infestations which were severe enough to warrant an insecticide treatment. 92% of Louisiana respondents reported that they had some fields that required treatment for rice water weevils. 88% of the respondents reported problems with rice stink bugs. While fewer people reported infestations of grasshoppers (24%), armyworms (24%), and chinch bugs (23%). The next most commonly reported insects were the rice leafminer (12%), stalkborers (11%) and colaspis (11%). Less than 10% of repsondents reported infestations of rice seed midge, aphids, rice levee bill bug, or south American rice miner that warranted an insecticide treatment. We asked more detailed questions about rice water weevil management strategies. A large portion of our time is dedicated to rice water weevil management because this insect traditionally causes the most significant damage to Louisiana rice production from season to season. If rice water weevils were a problem in your rice field(s), which method did you use to control or prevent a rice water weevil infestation? Note that respondents could choose more than one answer since they are completing a survey that relates to more than one production field. That will explain why the total response does not equal 100%. In 2008, among 163 respondents in Louisiana, the most common method used to control or prevent rice water weevil was drained field (43%). In 2009 among 130 respondents in Louisiana, the most common method used to control or prevent rice water weevil was Dermacor X-100 seed treatment (52%). In 2009, this was the only seed treatment available for use in rice. There was a decrease in the percentage of respondents who reported that they drained a field for weevil management while their was a substantial increase in the adoption of seed treatments and cultural practices (early planting and delayed application of permanent flood) which should result in decreased weevil injury. The next installation in this series of blog posts will focus on questions related to rice stink bug management. Do these observations reflect what you experienced in the 2009 or 2010 production seasons? An advanced entomology training will be held at the Acadia Parish LSU AgCenter office on March 1, 2010. The morning session will be a series of lectures presented by LSU AgCenter faculty. In the afternoon we will have a hands-on session using microscopes to study specimens. Rice growth and development – critical to understanding when to scout for specific rice pests. Insect collection and identification techniques. Insect lifecycles, anatomy and physiology. Insecticide classes and mode of action. If you are interested in attending this training or would like more information, please send me an e-mail at nhummel@agcenter.lsu.edu. RSVP is not required to attend. I hope to see you there.